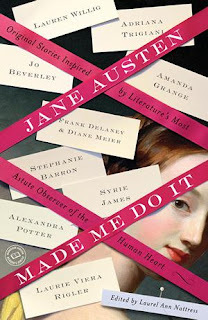 Please welcome to the Burton Book Review author of Jane Austen Made Me Do It, Laurel Ann Nattress! I read and reviewed it last month and really enjoyed these Austenesque stories. See below for how to enter for your chance to win this book. Read my review of JAMMDI! Hi Marie, it is such a pleasure to be here at The Burton Book Review during my Grand Tour of the blogosphere in celebration of the release of my new Austen-inspired anthology, Jane Austen Made Me Do It. I know that you are very fond of Austenesque fiction, so I thought I would talk today about how Jane Austen has influenced authors over the centuries and has inspired a whole new book genre. When Jane Austen was writing her novels in the late eighteenth and early nineteenth centuries, they were written at contemporary pieces. It is amazing to look back at them two hundred years later. They seem timeless. Her themes of financial struggles, social mobility, and romance are still fresh and relevant today, and her characters are so finely drawn and realistic that it makes us realize that human nature has not much changed either. Who among us can deny meeting some of her most famous archetypical personality in our lives? Perhaps an odious Mr. Collins from Pride and Prejudice was that blind date from hell, or a self-serving Fanny Dashwood type from Sense and Sensibility has permeated your work place, or, some of life’s first lessons made you feel a bit impressionable like young Catherine Morland from Northanger Abbey? Some of us are even lucky enough to claim to have met a Mr. Darcy from Pride and Prejudice, and others even luckier to have married one! Being lost in a Jane Austen’s world is such a pleasure. Unfortunately she only completed six full novels and one novella in her short lifetime. It is just not enough to satisfy her readers. In the 1830’s Jane Austen’s niece, Anna Austen Lefroy, was the first family member to take up the banner and write a completion of Sanditon, Jane’s last and unfinished novel. She could not complete it either. Next was another niece, Catherine-Anne Hubback, who wrote The Younger Sister in the 1850’s. Borrowing heavily from her aunt’s other unfinished fragment, The Watsons, it is the first completion of a Jane Austen novel. Over fifty years later in 1913, the novel Old Friends and New Fancies, by Sybil G. Brinton would be the first Austen sequel in print. A clever amalgamation of characters from each of Austen’s novels worked into Brinton’s own unique plot, one could say that it was the first Austen “mash-up,” published close to a century before Pride and Prejudice and Zombies would make the bestseller lists in 2009. From Regency to contemporary to romantic to fantastical, each of the stories in Jane Austen Made Me Do It draws from the authors unique and personal influence that Austen had on their writing in a new and exciting way. I hope readers will enjoy reading it as much as I had editing it. Editor bio: A life-long acolyte of Jane Austen, Laurel Ann Nattress is the author/editor of Austenprose.com a blog devoted to the oeuvre of her favorite author and the many books and movies that she has inspired. She is a life member of the Jane Austen Society of North America, a regular contributor to the PBS blog Remotely Connected and the Jane Austen Centre online magazine. An expatriate of southern California, Laurel Ann lives in a country cottage near Snohomish, Washington. Visit Laurel Ann at her blogs Austenprose.com and JaneAustenMadeMeDoIt.com, on Twitter as @Austenprose, and on Facebook as Laurel Ann Nattress. Enter a chance to win one copy of Jane Austen Made Me Do It by leaving a comment by 11/12/11, stating what intrigues you about reading an Austen-inspired short story anthology. Winners to be drawn at random and open to followers with US and Canadian addresses only. Good luck to all!